September 16, 2018: Five workers died while cleaning a septic tank in Jashpur district, Chhattisgarh. September 9, 2018: Five people died due to asphyxiation after they entered a sewage treatment plant in West Delhi’s Moti Nagar area. 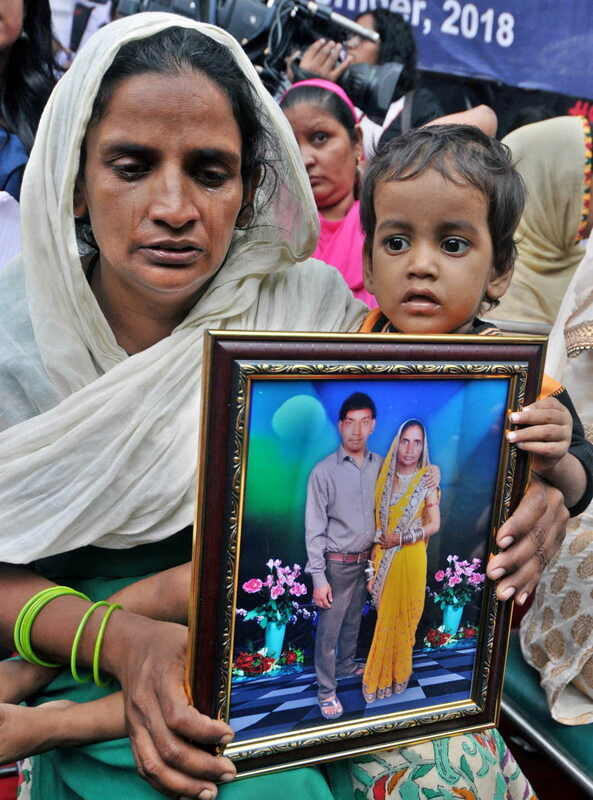 Five days later, another person died in Dabri area in New Delhi while cleaning a septic tank. According to official data, Tamil Nadu has reported 144 fatalities of workers engaged in manual scavenging since 1993. The Prohibition of Employment as Manual Scavengers and their Rehabilitation Act (PEMSRA), 2013, was enacted with the aim of eliminating manual scavenging in India, but five years down the line, the Act has proved ineffective in preventing deaths of manual scavengers in all parts of the country. The numbers are staggering, enough to provoke questions about whether the present Act needs to be amended or even whether the government should widen its scope. Experts believe that the penal provisions in the Act should be revisited to allow stringent punishment for any person, local authority or agency that employs people for hazardous cleaning of sewers and septic tanks which is banned under the current law. At present, under Section 7 of PEMSRA, a violation is punishable with two years of imprisonment or fine or both; but this has hardly prevented deaths of manual scavengers. Experts believe that there would be a greater deterrent effect if the punishment of imprisonment/fine is maximised to the extent possible. At the same time, they also believe that the present law should be adhered to aggressively in order to eliminate manual scavenging in its totality. They feel violators at present are not fearful of the penalties simply because they are aware of the lax implementation of the law. According to Bezwada Wilson, National Convenor of the NGO, Safai Karamchari Andolan (SKA), and a Magsaysay award winner who has fought tirelessly for the eradication of manual scavenging, no convictions have taken place under PEMSRA 2013 till January 2018. 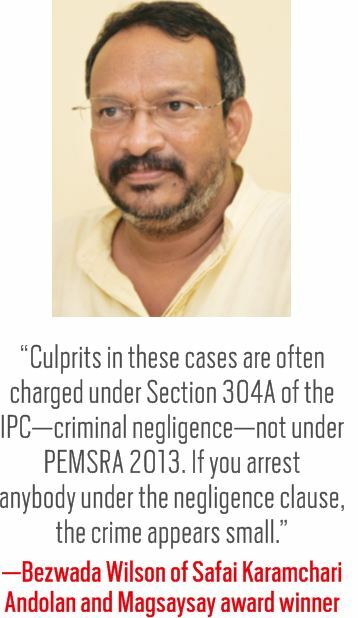 He said: “Culprits in these cases are often charged under Section 304A of the IPC—criminal negligence—not under PEMSRA 2013. The other major issue that defeats the aim of PEMSRA 2013 is the lack of machines to clean sewers and septic tanks. For instance, the Act provides for modern technology (mechanised) for cleaning of sewers and septic tanks to eliminate the need for manual handling of excreta during the cleaning process. “It shall be the duty of the appropriate government to promote, through financial assistance, incentives and otherwise, the use of modern technology,” the Act says. But reports indicate that little initiative has been taken by the central government as well as state governments in this regard. Indeed, experts say that if mechanised cleaning had been put in place and implemented vigorously, the many deaths that take place almost on a daily basis would have been averted. For millions of scavengers, life could become a lot more dignified and a lot less dangerous thanks to new sewer cleaning robots that are making their way into cities, particularly in south India. 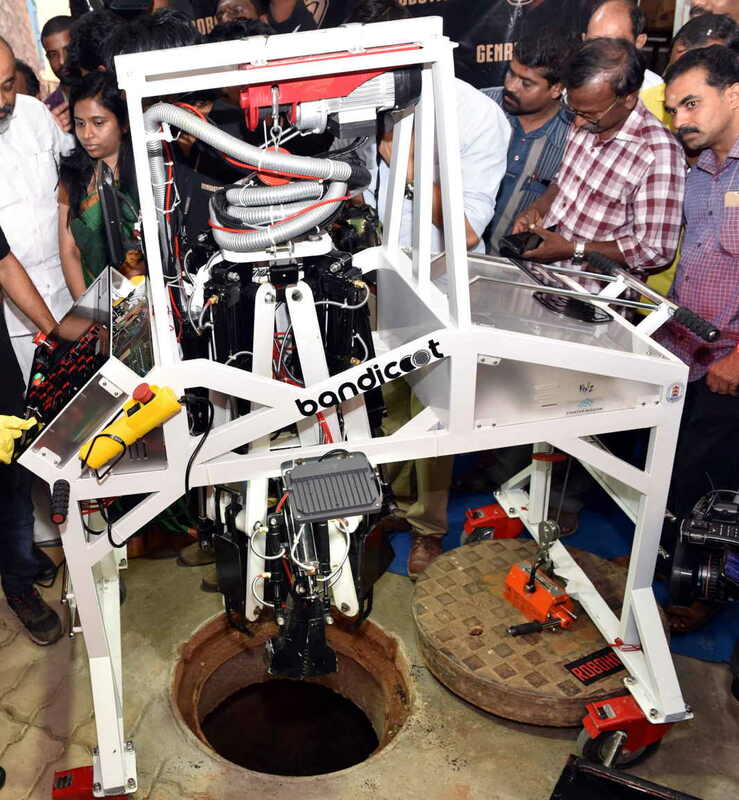 Bandicoot, a semi-automatic robot developed by Thiruvananthapuram-based start-up Genrobotics, costs around Rs 25 lakh and has been commissioned by several municipal bodies in Tamil Nadu, Andhra Pradesh and Kerala. It requires just one person to take it up to the sewer and the rest is done by the machine which is equipped with multiple cameras, a robotic arm with 360-degree manoeuvrability and a bucket to collect the waste. Another manhole cleaning robot, Sewer Croc, has been created by Bengaluru-based company Ajantha Technologies. This robot can be operated by manual scavengers without entering the sewers. Sewer Croc will soon be deployed in Hyderabad to clean sewers. The robot leverages a camera to detect obstructions and its powerful water jet and cutting system empties them out in the sewer line. It is also equipped with a device which detects poisonous gases to avert possible accidents. The National Commission for Safai Karamcharis (NCSK), the statutory body set up by an Act of Parliament for the welfare of sanitation workers, said that 123 people employed in hazardous forms of manual scavenging lost their lives while at work since January 2017. 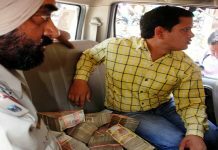 The information is based on media reports it collated, mostly from English and Hindi newspapers. No data was collected from the regional press and only 13 states and Union territories were included in the reports. NCSK officials were quoted in the media as saying that had they collated statistics from regional newspapers, the numbers would have been much higher. The reports indicated that the all-India figure of 123 by NCSK was very much on the lower side as compared to the figures collated by an SKA survey which pegged the death toll at around 429 in Delhi alone in the period 2016-18. Thus, if the all-India figure by SKA is to be believed, the figures could swell to 1,470 during the same period. 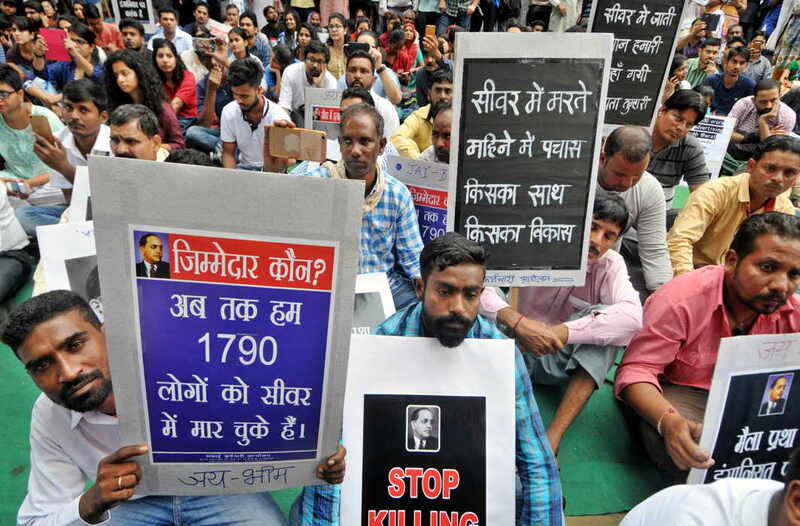 In fact, the Ministry of Social Justice and Empowerment told the Lok Sabha in 2017 that the country witnessed 300 manual scavengers’ deaths that year. Of these, 12 happened in Delhi alone while Tamil Nadu clocked the highest at 140. Karnataka was in second spot with 59 deaths and Uttar Pradesh followed next with 52 deaths. The SKA survey also says that India still has 2.6 million insanitary latrines that require cleaning by hand. The Socio Economic and Caste Census of 2011 reveals that over 1.8 lakh people from rural India are still engaged in manual scavenging. The Ministry of Social Justice and Empowerment while implementing a Self Employment Scheme for Rehabilitation of Manual Scavengers (SRMS) had identified 13,657 manual scavengers till June 30, 2018. To add to the problem, the flagship programme of the Modi government, the Swachh Bharat Mission (SBM) which aims to make India clean and filth-free does not have any provision to eliminate manual scavenging. While it aims to build toilets and protects the dignity of women by providing them with private spaces to defecate, it also fosters insult on women manual scavengers as they are the ones who clean human excreta from dry-pit latrines. The other bane of the SBM is that most of the toilets built under the initiative are single-pit and do not have continuous supply of water and are not connected to sewers. Every two to three years, they need to be emptied, thus leading to hazardous cleaning. Wilson was quoted in The Indian Express as saying that many toilets built under the SBM lacked water connections or a continuous supply of water, and are not linked to the sewage network. He is of the view that until a mechanised system of cleaning is implemented, more and more manual scavengers will die. He pointed out that the SBM represents toilet users and doesn’t pay heed to toilet cleaners. “The scheme is about the eradication of manual scavenging, but when you come to the programme, you will never find how it will be eradicated,” Wilson said. Another human rights activist said that under the SBM safety norms are being flouted, leading to the deaths of manual scavengers. Shomona Khanna, the lawyer for the Safai Karmachari Andolan, told India Legal: “Manual scavenging is perhaps the most abhorrent practice of caste-based enslavement and these people are treated as untouchables.” Reports say that this occupation is highly patriarchal. A Human Rights Watch report said that 95 percent of the workforce engaged in manual scavenging comprises women. Wages earned by women manual scavengers are lower, compared to their male counterparts. For instance, in rural India, women labourers get wages in kind such as food grains while men get cash. Women manual scavengers get 10-15 kg of food grains annually. A male manual scavenger earns around Rs 150-350 a day.